One thing that seems to unnerve people new to towing is being overtaken. The feeling that the tow vehicle and caravan are moving around seemingly uncontrolled when a large vehicle overtakes. Knowing what is actually happening when this occurs will help. If you can remember back to your science lessons I’m sure at some time someone mentioned a Dutch chap called Daniel Bernoulli who lived in Switzerland and had a bit of a thing for maths and fluids, and I don’t mean beer… although he might have done, I just don’t know. To cut a long story short he came up with a principle, which basically says – well this is my simple version – air (or fluid) moving faster on one side of an object than the other will create a force due to differing pressure. Accelerate the gas or fluid and the pressure drops relative to the other side of the object. What’s this got to do with being overtaken? 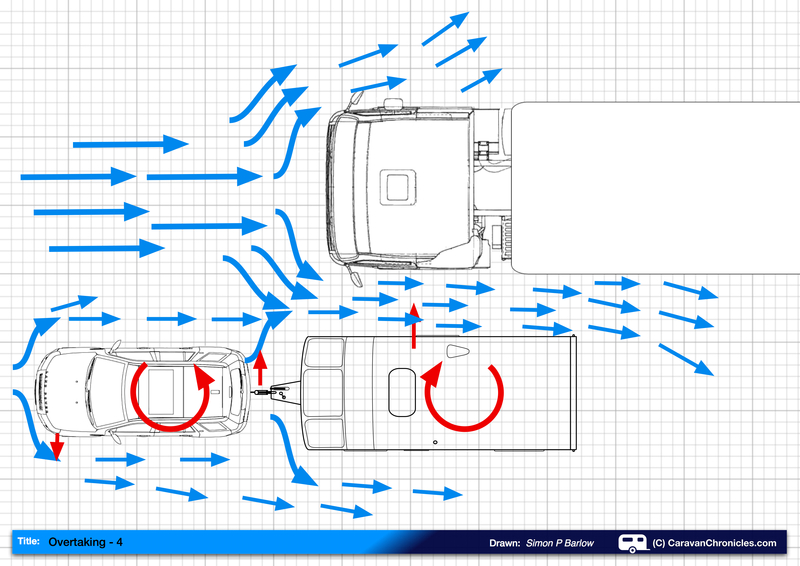 If you look at the drawing below, it shows (blue arrows) the airflow around the tow vehicle and caravan as an approaching vehicle starts to overtake. Air is being forced round the front of the two vehicles by virtue of them moving forward. 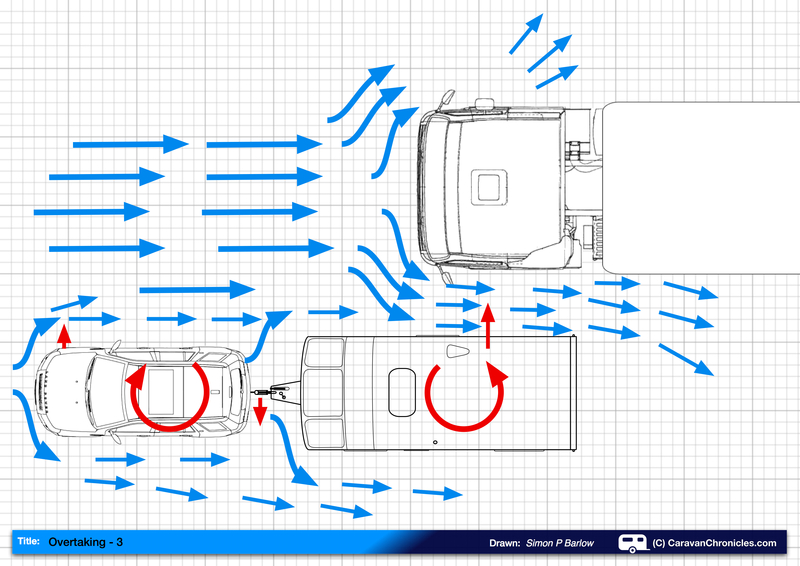 The air between the two vehicles is being squeezed and therefore accelerates. as the air between the two vehicles is moving faster than the air on the opposite side, there is a pressure difference, the pressure between the two vehicles is lower (ventrui effect). As the pressure is lower the rear of the caravan is drawn towards the overtaking vehicle. For the moment we will only consider single axle caravans. The ‘pivot point’ is effectively the axle – you know how easy it is when the jockey wheel is down to turn your caravan round by pushing on the rear side corner – well the same thing is happening here. The rear corner of the caravan is being drawn (red arrow) into the low pressure airflow. This has the effect of turning the caravan and applying a side load (red arrow) on the tow ball which tries to turn the vehicle. So what you feel as an overtaking vehicle draws level with the rear end of the caravan is the ‘feeling’ of being pulled or sucked in towards the other lane. If you haven’t been keeping an eye on your mirrors for overtaking vehicles this is when people new to towing start to get a little nervous. Airflow round an overtaking vehicle and its effects. As the overtaking vehicle draws level with the axle of the caravan, the forces are reduced due to the length of the ‘lever’ being reduced (you would find it hard to turn your caravan round by pushing on the side just behind the wheel for instance) and the effect it has on the tow vehicle is also reduced. Now as the overtaking vehicle still moves forward, the low pressure effect is still there but this time it is acting in front of the caravans axle and has the opposite effect. It draws the front of the caravan in, so applying a force tending to turn the vehicle away although is has less effect. This is the second part of making a novice tower nervous. By now the driver has usually applied some corrective steering input to move away from the vehicle after finding themselves being ‘drawn towards’ the overtaking vehicle, the force now being applied amplifies this and they find that the move over in the lane a little quicker than anticipated. Why does it have less effect? 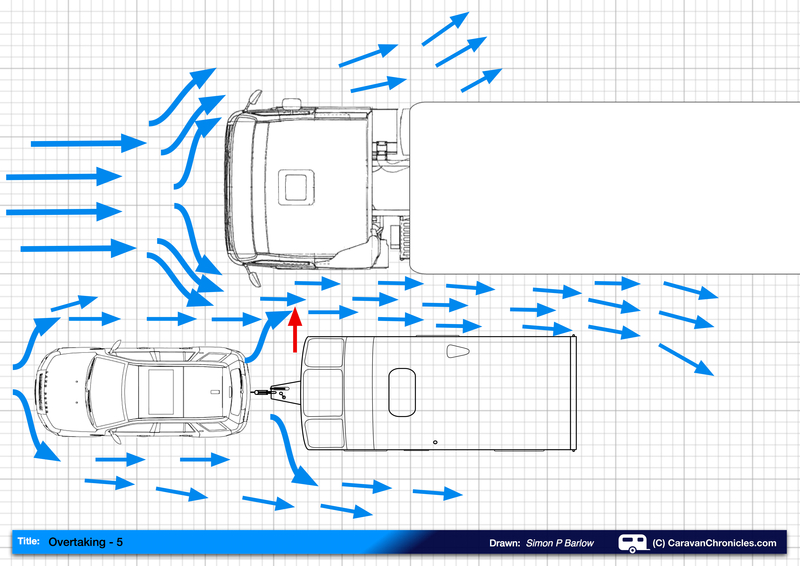 If you look at the drawing you can see that the airflow is still faster along the length of the gap between the two vehicles, so are still some forces acting on the rear of the caravan. However, by now some of the air between the two vehicles is spilling out of the gap over the roof of the caravan and overtaking vehicle therefore reducing the pressure difference slightly. By the time the front of the overtaking vehicle get level with the gap between the towing vehicle and caravan, most of the effects are over. Towing vehicles tend to be more aerodynamic than caravans and have a lower roof line allowing the faster moving air to spill out more easily reducing the overall effects. Now now doubt you have heard “Twin axle caravans are more stable” well when it comes down to being overtaken it’s probably correct. A single axle caravan resting on its wheels and jockey wheel is fairly easy to turn just by pushing on one of the corners, it will easily turn on its own axle. Now trying to do that with a twin axle caravan would be almost impossible unless you are a person that turns bright green when getting slightly annoyed. It’s the same when being overtaken, the forces in play are generally not large enough to have much effect on a twin axle caravan, and that’s why the statement “Twin axle caravans are more stable” is often heard. With 5th wheel trailers, the forces are still there, but as the hitch (pivot) point between the tow vehicle and trailer is on or in front of the centre line of the rear axle of the towing vehicle it is generally unaffected. Different vehicles overtaking will have different effects. An articulated lorry is likely to be passing you around 5 to 10 MPH faster, but a large commercial van – (Ford Transit, Mercedes Sprinter etc) or coach could be passing you with a 20 MPH or more speed difference and will have just as much effect or more due to the greater speed even though it’s lighter in weight. What can be done to reduce the effects of being overtaken? Keeping an eye on your rear view mirrors is important. Knowing exactly when a vehicle is going to overtake will allow you to prepare for the sideways movement. Giving yourself a greater sideways gap between you and the overtaking vehicle by moving over in your lane will also reduce the effects. Easing off the accelerator slightly so that the overtaking vehicle passes slightly quicker to will also help. For people new to towing, the big thing is not to over react and over steer, knowing what’s happening when you are overtaken is the first step in safer towing. This not only affects you when being overtaken, but also when overtaking. 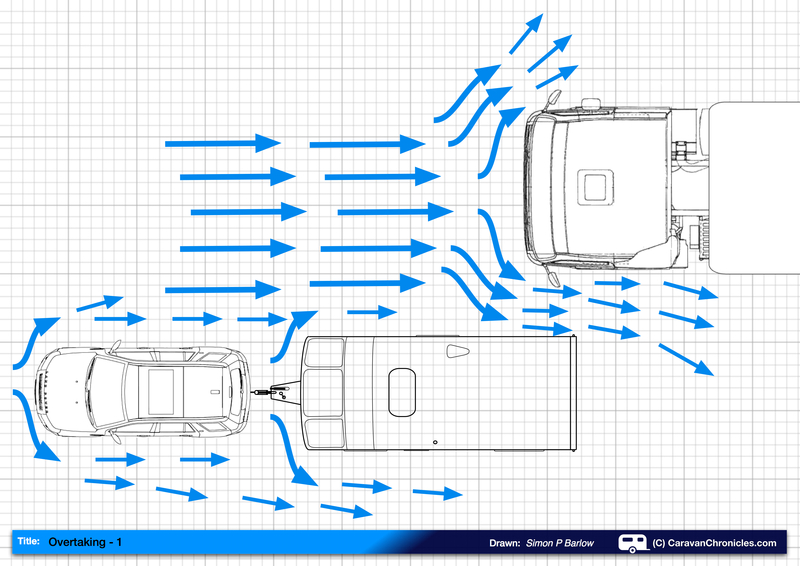 If you overtake a large vehicle, the effects are just the same. In Europe where towing speeds in some countries are higher, then you must be extra careful. I suspect, although don’t have any hard evidence, that this event was caused by the driver of the tow vehicle being caught out when they over took the HGV and possibly reacting by over steering. Although there are other circumstances quoted (down hill and too fast) I also wonder if the white van that had just overtaken the outfit at speed might have had some effect on the outfit. Interesting theory however I feel it may not be quite correct. I would have thought that the bow wave form the larger vehicle hits the rear of the caravan forcing it away from the larger vehicle. The drawbar then pushes the rear of the towing vehicle outwards and the driver has to do a correction to maintian a straight line. As the larger vehicle moves along the units, its bow wave then has an effect on the front of the caravan pushing the draw bar inwards and once again the driver has to do another correction. If the caravan and the towing vehicle are incorrectly trimmed, a snake may occur. We found that fitting shock absorbers helped plus as you suggested slowing down slightly to allow the bigger vehicle to overtake you quicker. The bow wave of air created by any vehicle has already started to accelerate down both sides of the vehicle creating a lower pressure area, it has to, to move out of the way for the following air. This lower pressure area can often be seen by the way dirt sticks to the sides of vehicles after travelling down a wet road. When any two vehicles pass, the effect between then is to create a ventui which accelerates the air even faster reducing the pressure further. When being overtaken, the first effect you feel is been drawn towards the overtaking vehicle, not pushed away. This is a great website. In recent years with modern stabilizers I only rarely feel any pull from overtaking vehicles however I’m sorry Simon, but I tend to agree with Marion. It seems to me that as a HGV starts to pass, its bow wave tries to push the rear of the caravan towards the curb. Then as it passes the fulcrum of the axle it tries to push the front of the caravan towards the curb. Then as the rear of the HGV passes, the vacuum behind it first tries to pull the rear of the caravan towards the overtaking lane and then it does the same with the front of the caravan. The oscillation effect can occasionally be felt in the car. I think the reason a Luton van gives a more noticeable effect is largely because it’s probably going at 70mph but also because its length is about the same as the caravan. After the initial bow wave effect at the rear, as it draws alongside its bow wave pushing the front of the caravan tries to turn the caravan at the same time as its suction effect is pulling the rear. The oscillation is complete as the suction effect is then felt by the front of the caravan. I think the most important word to remember is dynamic. There are so many forces and oscillations happening at once, from wind, road and springs, shock absorbers and stabilizers. I think the best advice is to stick to the speed limit for caravans, have a good stabilizer and concentrate on steering the car. 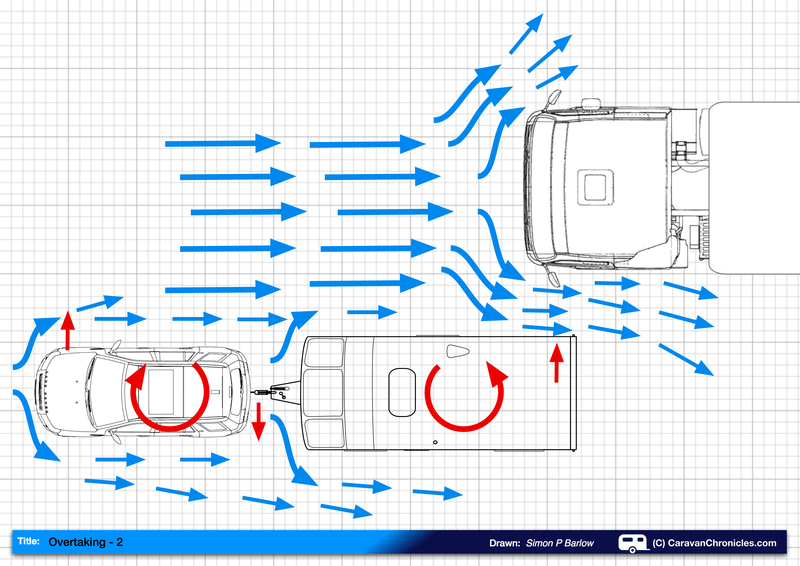 Don’t overreact and don’t try to correct the movement of the caravan by watching it in the wing mirrors. Concentrate on the car and let the caravan sort itself out. Then there’s one more conundrum. What effect does the gravitational pull of a loaded HGV have on the mass of a light caravan? Hmm! Hi Simon. A very very interesting a quite exact study and easily explained to the uninitiated. This can be easily demonstrated by having models of a car & caravan and one of an HGV articulated truck. In my own experience the trucks that are “Close-coupled” on the hydraulic ram at motorway speeds are slightly less of a problem – perhaps because of the smoother passage of air down the sides and across the top. The greatest influence that I have personally found on maintaining and controlling stability when being overtaken, or on the occasions that I have required to pass an HGV – correct tyre pressures all around the outfit. The shape of the load on the trailer can also be a deciding factor/influence on the air-flow after the initial push from the cab-wave. Tankers and old style roped and sheeted loads that do not offer uniformity down the trailer sides can often lead to unnerving buffeting until the very last of it has ‘spilled off of the rear end. 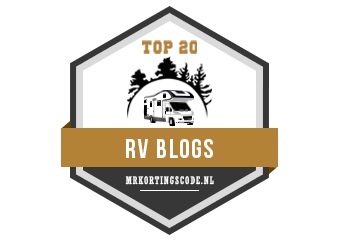 Have you tried this one on “The Other Forum” or even on Practical Caravan Magazine – forum? There are several on both that would attempt to convince – that black really is white and debunk it with their own; often misguided “logic”. I quite agree, the different types of HGV do have different effects. I can’t say I could distinguish between solid side, curtain siders and sheeted flat beds, but I can tell the difference between a coach and an articulated HGV. To me with our current outfit a coach seems to have more effect. I gave up a couple of years ago posting on forums, I prefer to go caravanning instead. Very informative article Simon, brilliantly explained (as ever). I think the above effect is very much felt on an older car without ESP, or on a car with ESP but without caravan ESP (also called TSA – Trailer Stability Assist) and with a non stabilising hitch on the van. I have an old caravan and tow with a Škoda Yeti with TSA forming part of the car’s standard ESP system – it switches on the moment you plug the caravan into the car. (This is NOT Alko ATC which you have to fit to the van itself) Soon after I got the van I towed it 90 miles to get serviced with the old hitch. It was fine but wriggling the steering wheel slightly I could make the van wiggle. Fetching the van again, with its new stabiliser hitch, was like night and day – the same wriggling on the steering wheel hardly made the caravan wiggle at all. I suspect the video you posted was an old van, with an old hitch and no stabilisers. Same for the Transit crash posted in the comments – Transits don’t generally come with ESP. As to this in and out sucking effect you describe in the article: can’t say I’ve ever felt it and for that I perhaps think the car’s TSA is doing it’s job? I shall look more closely in my mirrors next time though. I also think that Alko ATC only work when snaking is detecting over a certain level? This sucking in and out is not snaking but it does alter the cars course relative to the steering wheel – and that is what the car’s ESP is designed to correct. So as the car is pushed left and right as you describe, the car’s ESP will brake one relevant wheel to bring the body in line with what your steering wheel is doing. I don’t think your Freelander has ESP Simon and thus won’t have TSA. Would be interesting to see what a difference you’d feel with your caravan on a car with this system. As an aside, Mercedes said a few years ago more people’s lives have been saved by ESP than by airbags, since ESP prevents the accident from happening in the first place and airbags just deploy once it’s already too late. I don’t think there is any trailer fitted stability assist equipment that would react to the action of being overtaken on the market. The Al-KO stabiliser hitch does make some improvement, but at the end of the day it is just a passive high friction device. I have driven a number of vehicles with trailer stability assist – including Land Rovers, Range Rovers etc and you can still feel the effects and I don’t think the vehicles TSA would react to the forces acting on the caravan by an overtaking vehicle. I think the key is the driver. An alert driver should not have any problems, but a driver that is not fully aware of his surroundings, going to fast or not paying attention is more likely to over-react to a situation, and I think that may be the case in the video. The driver over-reacted to the effects of passing the lorry and it became self induced oscillation. The very nature of ESP is to counter this very effect described in this article – to stop a car’s body doing something other than where the steering wheel is pointed. That is 100% part of what TSA is meant to do, so I very much doubt your statement here, that TSA does nothing in an overtaking scenario. If it didn’t do anything then there is no point in having TSA designed into a vehicle to begin with surely. Granted I’ve not noticed it myself, but I’m sure if I look in my mirrors now I’ll see it happen. BUT I’m also 100% sure the effect is far less pronounced than what it would be in a car without TSA. ESP.. yes but TSA is a different thing. TSA works by detecting lateral loads imparted by the trailer on the vehicles rear sensors then applying selective breaking generating an adverse yaw action in the towing vehicle. TSA programs don’t react to the first lateral load as it could be the driver changing lanes quickly, they react to the second event… i.e if the lateral load is in the opposite direction and is an equal or increasing force. Speed and steering angle, throttle input, brake input, gear selected and terrain response setting are also factored in. The demonstration course I attended by Land Rover who developed the TSA programs which a lot of companies use certainly operates in this manner. OK… That makes sense. So it reacts in the same way as ATC. I’ll keep an eye in my mirror when something overtakes me in future. Perhaps it is the effect of the Yeti having a VERY short rear axle to towball distance, that makes the swaying of the car in this instance not as pronounced as on other cars.